Off The Presses: What Would Valentino Drink? Queens needs as many good cocktail places as it can get. Until last week, there was just Dutch Kills. Now we have The Astor Room, and M. Wells on the horizon. 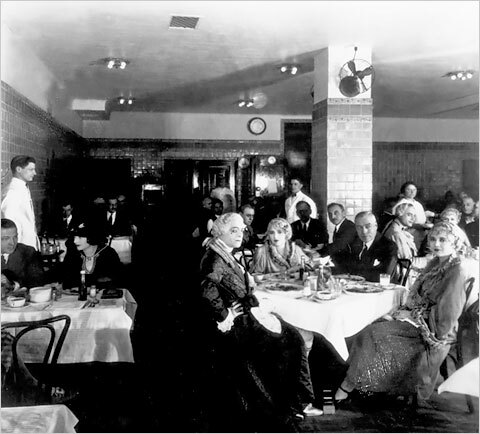 The Astor Room is the name that has been given to the old cafeteria at the famed Kaufman Astoria Studios in Astoria (see above for how it once looked; the dude in the powdered wig is Valentino), a place now outfitted as a swank 1920s-style supper club and open to the public. I sipped a few cocktails with mixologist Lynnette Marrero the other night and can safely declare the drinking to be good at this basement lounge, and relatively cheap. (Get the Filmograph for a rare experience of the onetime mixer Kola Tonic.) I would recommend swinging by between 5 and 7 p.m. on weekdays to take advatage of the free food available during the "apertivo service." Where Valentino once ate cafeteria food, film buffs can now dine on lobster Thermidor. The onetime commissary at Queens’ Kaufman Astoria Studios — long closed to all but those show biz pros who worked at the historic film center — has reinvented itself as a supper club — the Astor Room — and cocktail bar and thrown its doors open to the public. Chris Vlacich, owner of the longstanding Astoria favorite Piccola Venezia, remodeled the basement space and drafted the chef John Doherty, formerly of the Waldorf-Astoria. Together, they fashioned a menu redolent of the Gilded Age, offering new twists on old school dishes like beef tartare, sole meuniere and oysters Rockefeller. For the cocktail program at the Beaver Bar — named in honor of the animal whose pelts enriched John Jacob Astor, the man for whom Astoria was named — the mixologist team of Lynnette Marrero and Jim Kearns (formerly of Rye House) were brought in. They assembled a line of period-correct cocktails — the Mary Pickford (in which rum meets pineapple juice, grenadine and maraschino liqueur), the Filmograph (a sidecar variation that features hard-to-find Kola Tonic), and the Fairbanks (a martini variation) — as well as a couple of libations of more modern vintage that struck a similar tone, like the Valentino and the Astor martini. When the studio was founded in 1920, the space served as the film workers’ chow house. In 1942, however, when the Army took over the building and began producing military films in the studio, the cafeteria became an officer’s club. It remained in military hands until 1970. Real estate magnate George Kaufman bought it in 1980 and restored the studio to it’s original purpose. Little of the old cafeteria, aside from the general layout of the rooms, some original tile work on the walls and the marble staircase, was retained in the renovation. The new Art Deco look is anchored by a bar that was modeled after a 1920s bar Mr. Vlacich spotted on the Internet. The Astor Room will be open for lunch and dinner, and, from 5 to 7 on weeknights, will offer an “aperitivo service” with various free food like shrimp salad canapés, cheeses and charcuterie laid out across the bar. Eventually, after the restaurant settles in, Mr. Vlacich plans to offer an eclectic array of late-night entertainment. “Elmo loves our iced tea,” Mr. Vlacich quipped.